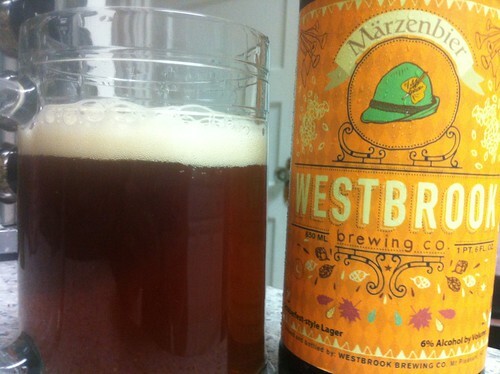 Westbrook Marzenbier | Drink. Blog. Repeat. There’s something about Oktoberfests marzens made in the Carolinas that continues to please me. Foothills’ Oktoberfest was one that of the recent ones that I’ve enjoyed, and that trend continues with Westbrook‘s seasonal Marzenbier. Of course, if it’s from Westbrook, I’m probably going to love it. Westbrook’s attempt at the style pours a translucent amberish brown color. There’s a bit of a lighter orange around the edges of the glass. There’s a finger of a foamy head on top but it settles quickly. Mild lacing and alcohol legs round it out. There’s a big caramel and toffee note on the nose. Definitely a strong malt character as expected. A very slight hint of figs and some nuttiness as well. Just a mild hop note. A nice, slight twist on the classic marzen. There’s not much going on toward the front of the tongue. It’s got a smooth mouthfeel with some mild carbonation. Where it really shines is on the end. There’s a big sweet bread flavor on the finish with just a mild hop bite. The caramel, toffee and nuts really shine as well. Very drinkable. As with Foothills’ offering, Westbrook’s didn’t do much to further my love for the style. But that’s probably just because I’m a stubborn hophead. Marzenbier is an incredibly drinkable, smooth and easy on the palate and very flavorful. There’s really nothing to not like about it.